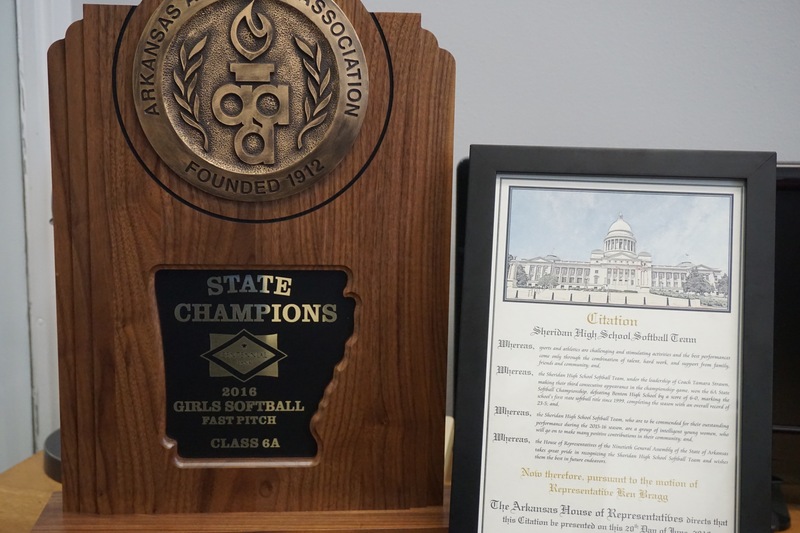 At the Sheridan School Board meeting held Sept. 12, 2016, Rep. Ken Bragg presented a citation on behalf of the Arkansas House of Representatives to the coaches and players of the Sheridan High School Softball Team, who won the 2016 6A State Softball Tournament in May. The citation recognizes the team for their hard work and outstanding performance during the 2015-16 season. "It meant a great deal to us that Rep. Bragg presented our team with the citation," said Superintendent Jerrod Williams. "The players work extremely hard both on the field and inside the classroom. It was exciting to see the smiles on their faces as he recognized them for their accomplishments." At the 2016 championship game, the Sheridan High School Softball Team defeated Benton 6-0, ending the season with an overall record of 23-5. More importantly, the team ended the school year with a cumulative GPA of 3.89.